It is important that you get a broken pipe fixed as fast as possible by a trained professional so that you can get your water up and running again. When your home’s main water line gets busted, you can be sure that your water bill will manifest all the wasted water. Aside from this particular problem, you’re likely to be kept awake by the amount of damage this can cause to your property. There will be flooding for sure, but what’s even more concerning is that you probably won’t have water to use at home because your water supply doesn’t reach the property. There’s only one thing to do – call the pros for main water line repair! We at Marquez Plumbing are highly skilled when it comes to broken water line issues and in no time, we can get to the source of the problem and restore the proper working order of this crucial component of your plumbing system. Our professional team has all the necessary equipment and materials for repairs and replacements, so all you really need to do is sit back, relax, and let us do our job. The process of main water line repair is actually not that difficult. We bet you can do a fine job of it as well, especially with all the tutorials available online. However, it truly is a lot of work, and if you don’t have a properly established system in approaching the problem, repair can take so much longer than necessary. More water can be wasted and flooding can cause more damage to your property. Why take the long route if there’s a shorter and more effective one? Repair is not all we can do. We will even reinforce the new fittings with insulating material so that they’ll be more impervious to freezing, which is one of the known causes of a busted main water line. We can throw in a check-up of your plumbing system so if there are other problems with it, we can fix those as well. That way, your household won’t have to pay for water that it does not even get to use. 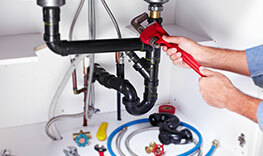 Our goal is to provide you a plumbing system that doesn’t only work, but also saves you money.